According to a recent study, 52% of consumers worry about their privacy when using public Wi-Fi. And they are right to do so. When you connect to public Wi-Fi—in an airport, a coffee shop or at a hotel—nasty things can happen. As we've written about before on Techlicious, any crook can set up a legitimate-looking free Wi-Fi hotspot and then sit and collect the traffic that goes through it—putting your personal data, including your logins and passwords, at risk. Fortunately, protecting yourself is easy to do with a virtual private network (VPN) that encrypts all of your traffic so no one else can read it. And, with the Freedome VPN app, from highly regarded Internet security company F-Secure, a VPN connection is super-simple to set up. It can, literally, be turned on with the click of a button, whether you're using an iOS, Android, PC, Mac or Amazon Fire device. 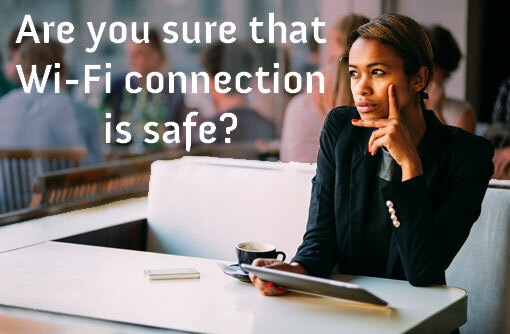 Even if you connect to a rogue network, Freedome's secure, encrypted connection from your device to the F-Secure Cloud makes your connection invisible in the Wi-Fi network and your data unreadable. So even if someone tries to snoop on you, they can’t tap into what’s yours. F-Secure Freedome takes your online privacy seriously by not requiring registration or keeping logs of your activities (unlike some VPN products that log users’ IP-addresses for weeks and require registration in order to be used). And with Freedome, you can even choose your device’s virtual location from servers around the world, further protecting your privacy and enabling you to avoid location restrictions on video streaming services. Encrypting the information will protect you from people spying on your network, but it still doesn't prevent advertisers and others from tracking your activities using cookies. Freedome blocks these trackers so you can browse anonymously and freely, while the new Tracker Mapper feature shows you exactly who tried to track you on an interactive. virtual map. And Private Search ensures you can search privately online without sacrificing the speed or accuracy of your search results. If you care about your online privacy, try Freedome completely free for 14 days—no credit card or registration necessary. We think you'll love the freedom Freedome provides, to go online without fear, wherever your travels may take you. Private & protected: Hackers can't steal your stuff and annoying advertisers can't track you. Wi-Fi Security: Connect to any hotspot, public or private and surf carefree without exposing your traffic. Remove geo-blocking: Access geo-restricted content by changing your virtual location. Elegant simplicity: Control your online privacy and security with the push of a button. Available for OSX 10.9 or later, iOS 7.0 or later. Android 4.0.3 and later, Kindle Fire and Windows 7 or later.